I'm usually the person who likes to hang in the background, hopefully going unnoticed. That's not going to happen when I wear this Nike jacket. 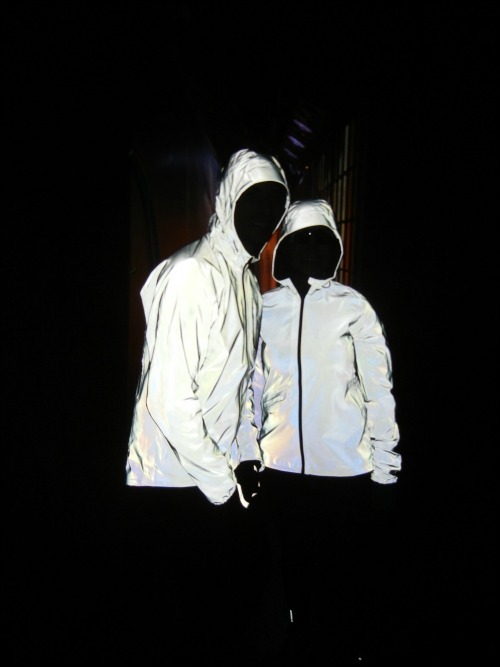 Unveiled at the Fleet Feet Fall Fashion Show last night, the Vapor Flash Jacket has technology that produces 400-candlepower reflectivity. So much for slipping into the background: We had more than 100 LED lights flashing on us to show just how bright these jackets are when it's pitch black. It's perfect for running in the dark--and I'd contend that it's even better for biking since I always forget to bring my blinky light with me and can only hope that drivers see me pedaling on the roads. It's bright on one side but reverses to a matte fabric with glow accents so you can tone it down where needed. I really wanted to go home with this jacket (Fleet Feet was kind enough to reward the models with one of the running fashions we sported during the show), but this one was such a hot commodity--and it retails for $300--it had to stay at the store. Christmas is coming...can we say wish list? Photo courtesy of Lauren Matricardi.